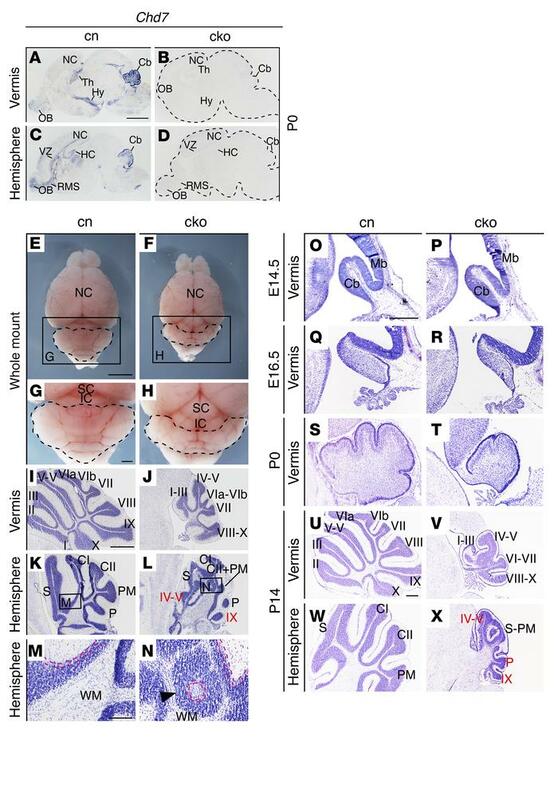 Chd7 deletion from embryonic neural progenitors causes cerebellar hypoplasia and foliation abnormalities. (A–D) In situ hybridization for Chd7 exon 3 transcripts (blue) in sagittal sections through P0 Chd7fl/fl (control [cn]) and nestin-Cre Chd7fl/fl (cko) brains. Sections through the cerebellar vermis (A and B) and hemispheres (C and D) are shown. Note Chd7 expression in the olfactory bulb (OB), neocortex (NC), thalamus (Th), hypothalamus (Hy), hippocampus (HC), ventricular zone (VZ), rostral migratory stream (RMS), and cerebellum (Cb) in cn sections (A and C), absent in the cko (B and D). (E and F) Whole-mount images (anterior to the top) with cerebellum outlined. (G and H) High-power images with cerebella outlined. SC, superior colliculus; IC, inferior colliculus. (I–N) Cresyl violet–stained sagittal sections through the cerebellum, anterior to the left, with vermis folia labeled with Roman numerals according to Inouye and Oda (77). The simplex (S), Crus I (CI), Crus II (CII), paramedian (PM), and pyramidis (P) folia are labeled in hemisphere sections. Note cerebellar hypoplasia (J and L) and disorganized folia in cko hemispheres (L, boxed area). Note the expansion of lobules IV–V and IX from vermis into the hemispheres (L, red text). (M and N) Magnified view of the boxed areas in K and L with PC layers outlined in broken red lines. Ectopic granule cells organized around a circular cluster of PCs are indicated with a black arrowhead. WM, white matter. (O–X) Cresyl violet–stained sections through the developing cerebellum at the time points indicated, anterior to the left, with cerebellar folia labeled as above. Note the vermis hypoplasia at E16.5 and P0, and striking hypoplasia of both vermis and hemispheres at P14 (V and X) in the cko. Mb, midbrain. Scale bars: 1 mm (A, E, I, and O), 300 μm (G and U), 100 μm (M).